Have you ever been to Vienna? I wasn't sure what to expect but it was just beautiful. I loved the old buildings, the winding streets, the museums, & the desserts. Especially the desserts. I'll start off with the Sachertorte, Vienna's most famous dessert. Dense chocolate cake, tempered by layers of apricot jam. Beyond delicious. 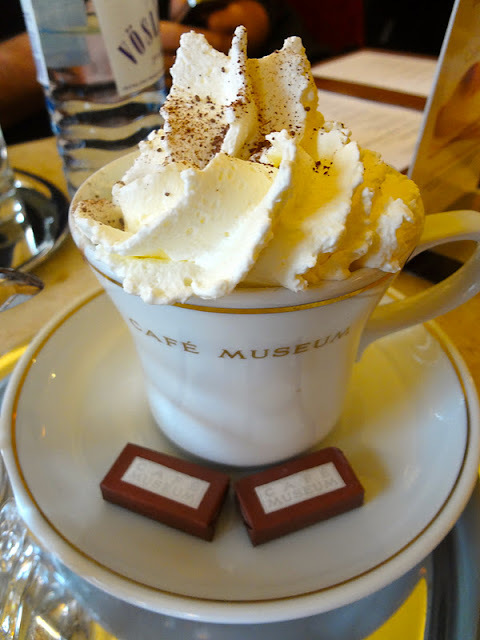 To give you an idea of how much the Austrians like their sweet treats, here's a cup of hot chocolate I ordered. It comes with two tabs of sugar to add. To your hot chocolate. If you make it to Vienna, bring your sweet tooth and stay hungry!